View More In Refillable Containers. A MUST HAVE CONVENIENT AND ECONOMICAL BUNDLE TO TRANSFER AND DISPENSE ESSENTIAL OILS PERFUME OILS, BLENDS AND OTHER LIQUIDS! 1, Put the edge of the opener underneath the reducer and push down. Reducer would pop out. 2, Use the roll-on bottle to apply the perfect amount of product each time. 4, Then firmly tighten the cap until the roller-ball snaps in. 5, Use the roll-on bottle to apply the perfect usage. The glass provides protection from potentially harmful light and the convenient size makes it perfect for travel. 6 extra stainless steel balls & 1 essential oils opener & 24 pieces essential oil bottles stickers & 2x 0.5ml droppers & mini funnel included. 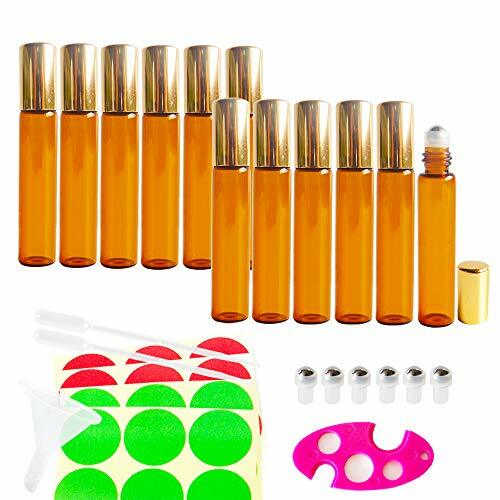 Convenience - Included extra roller ball for replacement, 24 pieces essential oil bottles stickers for marking the type of oils you filled with the bottles. Perfect Tools - Portable 10ml bottles, perfect for applying diluted essential oils, perfume oils, blends, or other liquids. Perfect for travel, and conveniently fits in your purse. Essential Oil Opener - It is ready to remove the orifice reducer insert or press on roller bottles caps for those tiny sample bottles with standard 5ml, 10ml or 15 ml (Central hole's diameter 12.5mm, 7.8mm, 9.7mm ). And 0.5ml dropper pipettes is an ideal equipment to transfer and dispense liquids. Safe - Glass roller-on bottles protect against harmful UV rays, economical, convenient and refillable. If you have any questions about this product by GreatforU, contact us by completing and submitting the form below. If you are looking for a specif part number, please include it with your message. Blessed Lourdes HOLY Water in a Glass Bottle Depicting Our Lady of Lourdes & Lourdes Prayer Card. Cosmetic or Makeup Organizer "White" That Spins for Easy Access to All Your Beauty Essentials, No More Clutter! Only Requires 12" of Space on Counter & Holds Taller Bottles.. Proudly Made in the USA! by PPM.